CLIA created the selling cruise conference 9 years ago and its foundation was to inspire and update agents whilst showcasing the best within the cruise industry, all in one place. This year’s event was better than ever with the highest attendance figures it has seen in its history. Full Picture is fully loaded with cruise content, so it was a clear choice for Zolv to attend and exhibit as a sponsor. Attending the selling cruise conference was the perfect opportunity to show agents that there is a product available to help them improve conversion, up-sell and help drive their cruise sales. It isn’t just about having a simple phone conversation to customers anymore. It is a visual connection instead, taking the dialogue to a different level, visually and instantly. It provides the user with everything they visual require, taking them on a visual conversation and journey with an agent. Conversations coming alive by sharing photos, video, deck plans, and brochures and more all directly to a customer's screen taking them on a virtual tour on board. During the Selling cruise experience, Zolv decided their stand would be a little more interactive and invited award winning caricaturist Tony Parsons to be involved on the stand. Tony was on hand to draw willing delegates in his distinctive and entertaining style. 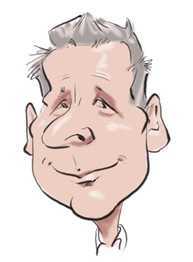 Providing the delegates with caricature’s caused hilarity and amusement with visitors to the Full Picture stand. All participants of the caricature were provided their own digital “Full Picture” of themselves so they could have a memento, you may see one or two hanging in Travel Agents around the country!